Compost is the nutritious result of decaying vegetation... yum. What is Compost? The answer lies on the forest floor. Dirt is dirt is dirt... right? Not really. Here's the scoop. For thousands of years leaves, needles, plants and fallen trees have accumulated on the forest floor. As it decays this vegetation turns into compost, an organic, loamy, nutritious growing medium that drains well while holding enough moisture to sustain plants and trees. 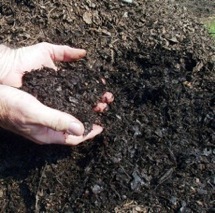 On a smaller level, home composters bring this luscious soil to back yards and gardens in cities as well as rural areas. Kitchen and garden scraps and clippings are transformed into rich compost that can be used in pots, vegetable gardens and flower beds. Compost makes a great growing medium by itself in small pots but many gardeners use it to improve the tilth of existing garden areas. (Tilth is a measure of the health, nutrient level, drainage and general structure of soil). Adding compost to clay produces a soil that is easier to handle with better drainage and higher nutrition. Sandy soils hold water better and have a higher nutrient level with the liberal addition of composted materials. A garden composter provides the ideal environment for making your own nutritious growing medium - AKA compost. Visitors to our "What is Compost page may also be interested in the following pages.